FORT WORTH, TEX. 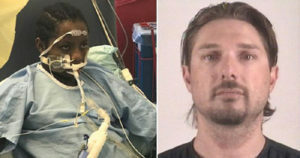 — Dorika Uwimana has been in the hospital for the past 4 months due to severe injuries after being brutally assaulted by Terry Wayne King II, a white man, while she was on her way to school. Her injuries were so bad that she needed a heart transplant, and it wasn’t until last week that she finally received a new heart. In April, Dorika was walking to a bus stop to go to Western Hills Elementary School when a stranger approached her to ask for help. Then suddenly, the stranger went to throw her to the ground and strangle her. In July, the suspect, who was identified as 36-year old Terry Wayne King II, was arrested by U.S. Marshals on charges of in-jury to a child causing serious bodily injury and assault. He is now being held in an Oklahoma jail. King, who is a truck driver, had numerous criminal records before. The police are investigating for more incidents. No motive for the attack has yet been revealed. Meanwhile, Dorika suffered from severe heart damages after lacking oxygen for so long due to strangling. Doctors said she needs a heart transplant, but then it’s not easy to get a match. Buhinja, a 36-year old father to Uwimana and five more sons, shared that he and his family are refugees that came to America in 2016 to escape the war from Congo. They waited for 15 years living in Uganda to immigrate to the USA. Little did he know that her daughter would suffer more now that they are in the USA. “In Africa, there are problems. Now, here too I get problems and I was thinking this isn’t good,” Buhinja said. Favorably, last week, Dorika had a match from a donor’s heart. She underwent a heart transplant at Children’s Hospital in Dallas. Still, she has to stay at the hospital for recovery. A GoFundMe has been set up to help Dorika and her family with the hospital bills and other daily expenses. So far, they have raised over $9,000 of the $25,000 goal.